Order your Novopro PS1XXL Podium Stand from AMS and enjoy 0% Interest Payment Plans, Free Shipping, Free Extended Warranty & 45 Day Money Back Guarantee. The Novopro PS1 XXL Adjustable Podium Stand 7’8? (White) is a unique and innovative with variable height podium stand with scrims. This new, unique stand requires no tools for assembly and is designed for maximum stability even at its top height of 7’8”. The PS1 XXL is made from durable white powder-coated steel and includes both black and white scrims, bag sets for transportation, and 35mm speaker mount adaptor. The Novopro PS1 XXL is the most convenient lighting stand when it comes to both use and transportation. 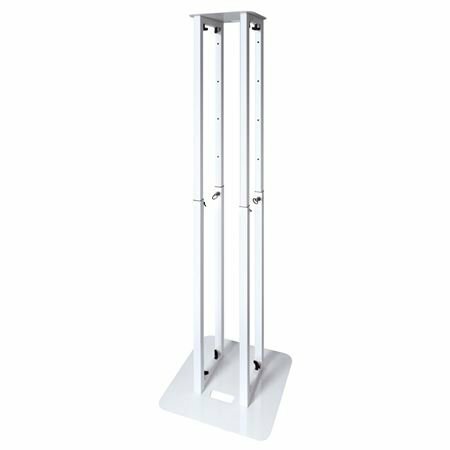 The retractable legs extend from 4’7” up to 7’8” which enables you to condense them for transport and storage, as well as create unique designs with varying heights for any event or application. Designed for maximum stability even at its top height of 7’8? Love how the it have different level of hike . Love the Storage bags .easy to set up ..